How many times have you looked in the top of the raku kiln to see if the glaze is bubbling yet? It seems to take forever! I know…. I have lost bangs and part of an eyebrow with my impatience! If you are familiar with an Income Statement, (aka Profit and Loss Statement, P&L, Statement of Earnings), then you have had the same feeling! You have worked and created and sold your work and, now, you are wanting to know if there is income yet? If you are not familiar with the Income Statement, then let’s dive in. In the last post, we talked about the Balance Sheet and how it was a “selfie” of your business at one point in time. It told you the cash, accounts receivables, and inventory you had (or your Assets). And, that “selfie” told you the amount of money you owed the bank, your credit cards, your vendors (or your Liabilities) with the remaining amount being the part of the business that was your Equity. So where does the Income Statement fit in? It is the results of the heart of the business. If you are in business to support yourself with your art, then you are creating and you are selling. There is a cost to creating and there is income related to the sales of your creations. Let’s dive into Expenses first! There are two types of behaviors for expenses: Fixed and Variable. In my world, I remember the Fixed expenses as those checks I write for the things that still cost me if I never produce d another piece of art. The electricity for the lights while I sit and brainstorm in my studio and do nothing. The rent I pay for that studio where I am continuing to do nothing but brainstorming or taking that creative nap. So, think of the fixed expenses as the costs you will incur before you start creating. The very basic costs that you would have at any business no matter what product you were creating. There would probably even be some other utilities and salaries for which you could be responsible as you sits and thinks. The second type of behavior: Variable. Okay, stay with me here because I want to break this down again. There is a semi-variable and a true variable. That is really getting into the grit of the matter yet it bears talking about for a few sentences. Once you start creating, you will need supplies – the wedging table, the wheel, the pug mill, the needle tool, the sponge, …..things that you will use on many different projects and will not be able to tell how much it costs for each project. These are semi-variables….Costs you incur after you quit thinking about it and prepare your place for work. Once you have bought these items, you replace them as they wear out. Let’s pause and see if it helps to explain what the true variable is, in contrast. When I fire up my electric kiln, I know exactly what it will cost to fire that kiln and I can divide that cost by the number of pieces in the kiln to get a round number of the cost to fire each piece to bisque. That is a true variable cost. I would never have incurred that cost if I had not created the piece and I can specifically identify the cost of the kiln firing to a specific piece. Hope that helps! If not, just remember there are fixed costs and variable costs……My intent for the detail was to provide a working vocabulary to you in a new language. So why do we care about the behavior categories? It matters when you are making a plan for income. If you can figure out what the fixed and variable costs are, you know how much you have to sell to cover the cost of your creations, lights, rent, and your salary, to name a few. But is that all there is? NO! Now we have to get to introduce a couple more concepts. Gross Margin and Operating Margin! First let’s discuss Gross Margin. 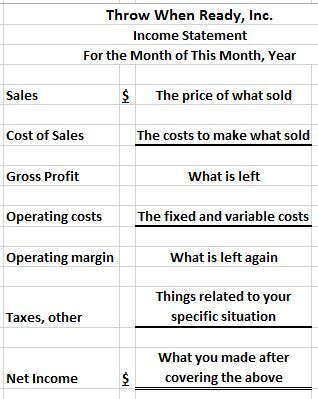 In an Income Statement, Sales are the first thing up. This category includes all the cash (we are assuming a cash basis) that you received for the sales you had. Next is the Cost of Sales. These are all the costs related to the pieces you sold. They would be variable costs….Costs you would not have incurred unless you were creating to sell for a profit. So, for example, the cost of running the kiln, the cost of the clay, the cost of the glaze, the cost of the labor (usually estimated) to make the piece would be included in here. All of these costs are added up and put into cost of sales because they can specifically be identified as costs that were incurred to make the art you just sold. 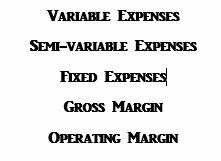 Now we have the first subtotal in the Income Statement or Gross Margin. This tells you how much you are making on creating your art. This tells you what is left to apply towards the costs of running the shop, the gallery, the equipment, the salaries, the marketing, the postage, and on and on. If you do not have anything left over at this point, you did not charge enough for your art. Next concept is Operating Margin. All those fixed costs we talked about earlier and some variable and semi-variable costs get grouped as Operating Costs. These include your utilities, your rent, your marketing, postage, supplies, printer toner, sponges, clay tools, meals you ate while working, travel costs to teach others your special talents, etc. These types of costs would not be included in Cost of Sales, (aka the cost of making the art that sold). The Operating Margin is what is left over after you have considered all the things you paid for that were not specifically related to making the art you sold. We identified some of them in the previous paragraph. If you didn’t have a positive Gross Margin, then Operating Margin looks even worse. 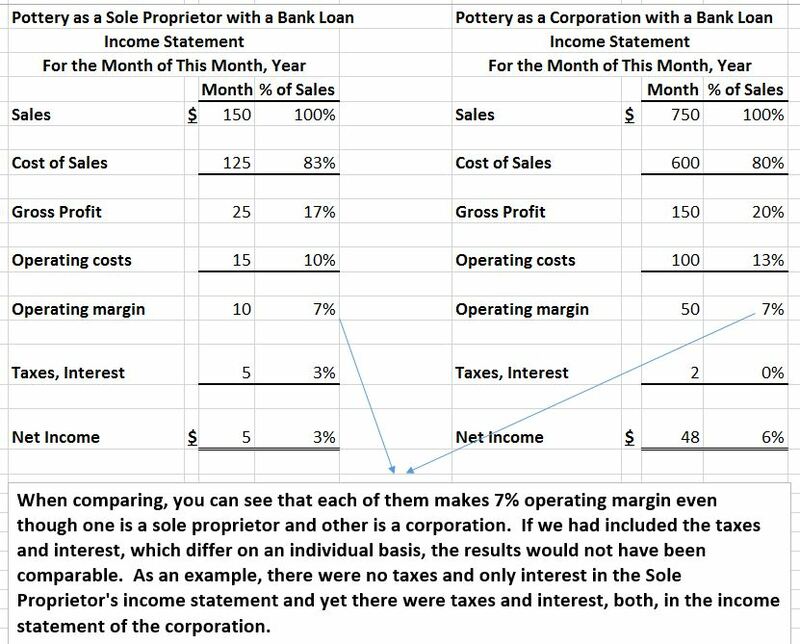 If you had a positive Gross Margin, yet after deducting the Operating Costs, you have a negative Operating Margin, then one of two things need to happen. You either need to consider if you can sell your art for more or check that your costs for making the art or running the studio are the best costs for which you can negotiate. That is a basic primer on the income statement. It has a formula which never changes! There are other terms we defined also: Next, we will jump into the Cash Flow Statement, the best statement of all! 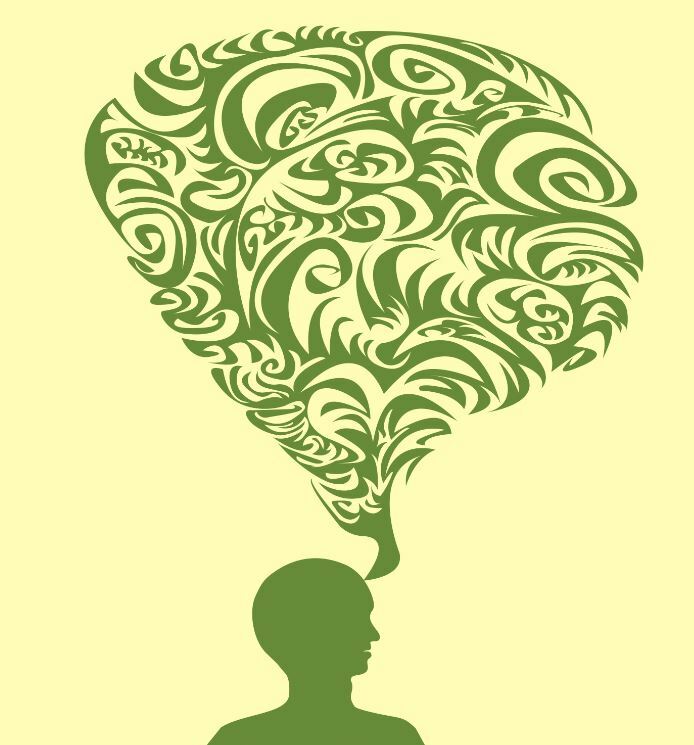 When you understand the Cash Flow Statement, you are talking the artful accounting language of money! And there is more excitement after that!